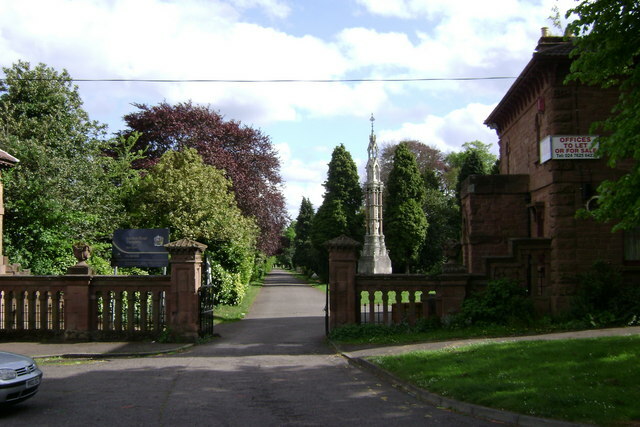 Coventry (London Road) Cemetery contains 123 Second World War burials, 21 of them forming a small group in Square 348, the rest scattered. 1 of these burials is an unidentified British soldier. In the war graves group are buried an officer and six men of the Royal Engineers who were killed by a bomb which exploded after they had spent two days removing it from a situation in which it endangered the public. The cemetery also contains 94 scattered burials of the First World War and one Belgian war grave. 90029 Battery Sergeant Major Charles Edward Hayden Parker, V. C. (Received the V. C. during the Second Boer War in 1900). Son of William Parker (Crimean Veteran); husband of Louisa Parker, of 2 Court, 4 House, The Butts, Coventry. Born at Woolwich, London. Citation An extract taken from the London Gazette records the following: "War Office, June 26, 1900. The Queen has been graciously pleased to confirm the grant of the decoration of the Victoria Cross to the undermentioned Officer, Non-Commissioned Officer, and Soldiers, which decoration has been provisionally conferred upon them by the Field-Marshal Commanding-in-Chief in South Africa, in accordance with the rules laid down in Her Majesty's Warrant instituting the decoration, for their conspicuous bravery during the action at Korn Spruit on the 31st March 1900. On the occasion of the action at Korn Spruit on the 31st March, 1900, a British force, including two batteries of the Royal Horse Artillery, was retiring from Thabanchu towards Bloemfontein. The enemy had formed an ambush at Korn Spruit, and before their presence was discovered by the main body had captured the greater portion of the baggage column and five out of the six guns of the leading battery. When the alarm was given Q Battery, Royal Horse Artillery, was within 300 yards of the Spruit. Major Phipps-Hornby, who commanded it, at once wheeled about and moved off at a gallop under a very heavy fire. One gun upset when a wheel horse was shot, and had to be abandoned, together with a waggon, the horses of which were killed. The remainder of the battery reached a position close to some unfinished railway buildings and came into action 1,150 yards from the Spruit, remaining in action until ordered to retire. When the order to retire was received Major Phipps-Hornby ordered the guns and their limbers to be run back by hand to where the teams of uninjured horses stood behind the unfinished buildings. The few remaining gunners, assisted by a number of Officers and men of a party of Mounted Infantry, and directed by Major Phipps-Hornby and Captain Humphreys, the only remaining Officers of the battery, succeeded in running back four of the guns under shelter. One or two of the limbers were similarly withdrawn by hand, but the work was most severe and the distance considerable. In consequence all concerned were so exhausted that they were unable to drag in the remaining limbers or the fifth gun. It now became necessary to risk the horses, and volunteers were called for from among the drivers, who readily responded. Several horses were killed and men wounded, but at length only one gun and one limber were left exposed. Four separate attempts were made to rescue these, but when no more horses were available the attempt had to be given up and the gun and limber were abandoned. Meanwhile the other guns had been sent on, one at a time, and after passing within 700 or 800 yards of the enemy, in rounding the head of a donga and crossing two spruits they eventually reached a place of safety, where the battery was re-formed. After full consideration of the circumstances of the case the Field-Marshal Commanding-in-Chief in South Africa formed the opinion that the conduct of all ranks of Q Battery, Royal Horse Artillery, was conspicuously gallant and daring, but that all were equally brave and devoted in their behaviour. 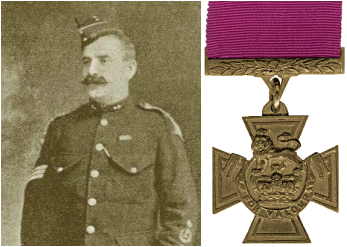 He therefore decided to treat the case of the battery as one of collective gallantry under Rule 13 of the Victoria Cross Warrant, and directed that one Officer should be selected for the decoration of the Victoria Cross by the Officers, one non-commissioned officer by the non-commissioned officers, and two gunners or drivers by the gunners and drivers. A difficulty arose with regard to the Officer, owing to the fact that there were only two unwounded Officers - Major Phipps-Hornby and Captain Humphreys - available for the work of saving the guns and both of these had been conspicuous by their gallantry and by the fearless manner in which they exposed themselves, and each of them nominated the other for the decoration. It was ultimately decided in favour of Major Phipps-Hornby as having been the senior concerned." Serjeant C. E. H. PARKER was elected by the non-commissioned officers as described above.